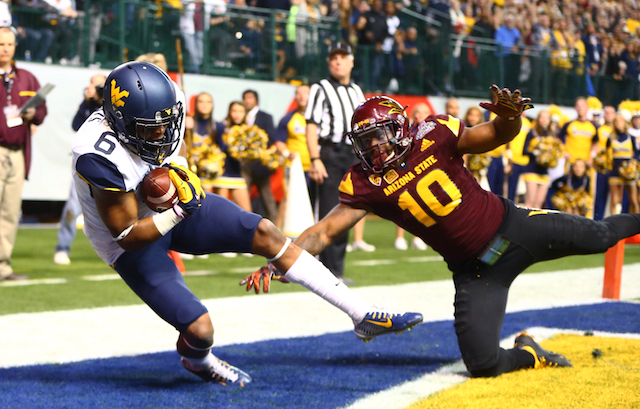 The final bowl game of the season was a wild one, as West Virginia edged out Arizona State in a 43-42 Cactus Bowl. The Cactus Bowl was the 40th bowl game, and it delivered an exciting shootout between West Virginia and Arizona State with the Mountaineers coming out with a 43-42 win. Defense was optional in the Cactus Bowl. The two teams combined for 1,196 total yards of offense, including 950 passing yards by Skyler Howard and Mike Bercovici. Howard's 532 yards set a Cactus Bowl record for passing, and Daikiel Shorts (97 yards, two touchdowns), Shelton Gibson (143 yards, touchdown) and Ka'Raun White (116 yards) all had massive receiving games for the Mountaineers. After a number of blowouts over the last three days, the last two bowl games of the season delivered on exciting finishes. Hopefully, the national title game between Alabama and Clemson on Jan. 11 can follow suit. Story of the game: West Virginia's offense averaged eight yards per play and a ridiculous 19 yards per completion as the Sun Devils' defense offered little resistance to the passing game. 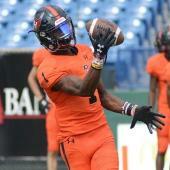 Arizona State was able to pick Howard off twice, which helped them keep in touch with the Mountaineers. The key play for West Virginia in a game where the passing game dominated was a 24-yard run on 3rd-and-22 on the Mountaineers' final drive by Wendell Smallwood. That run kept West Virginia's drive alive and set up the go-ahead touchdown with just over two minutes to play. Player of the game: Howard completed 28-of-51 passes for 532 yards with five touchdowns and two interceptions. He missed a few deep balls but was terrific overall. In the red zone, he was great and tossed a pair of beautiful fade routes and he limited the mistakes and turnovers that plagued him this season. Play of the game: We should have known early on that this game was going to get really weird. While the Alamo Bowl was finishing up this double-tipped completion happened for West Virginia. That play set the tone for a weird night in the desert. Tweet of the game: West Virginia was just bombing the ball downfield all game. The Mountaineers were not here for the short passing game. They came to party. This was tweeted out in the third quarter or so. Just heaving it down there.